The Civil War Reenactors Rise Again, Erik Spitznagel, Business Week, February 25, 2011. Tom Hunge knows he's living in the heyday of the modern sutling business. The 67-year-old from Winchester, Va., can't seem to keep enough of his authentic-looking 19th century military supplies—from vintage pencils (25 cents each) to Whitworth rifles ($1,000 and up)—on the shelves. "There have been days when I never put the phone down," he says. "I keep it next to my ear and write new orders for eight hours straight." 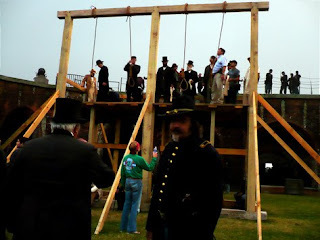 This April marks the 150th anniversary of the start of the American Civil War, which, among other things, promises to make 2011 the biggest year for the Civil War reenactment business in 146 years. Hunge estimates that, after a dip in popularity over the past decade, there are now 50,000 serious reenactors in the U.S., a number likely to grow during the sesquicentennial. With a Civil War wardrobe and accessory kit—sans rifle—costing roughly $1,000, 2011 also promises to be very kind to the sutling trade. Hunge got into the business of sutling, or selling faux-military supplies, in 1961, during the war's centennial. Back then he hauled "six tons" of merchandise to a Gettysburg (Pa.) reenactment and "came home with an empty trailer and a cigar box full of cash," he says. Although his company, Winchester Sutler, now sells exclusively via mail order and the Internet, 2010 sales were up 50 percent from the previous year. In 2011, Hunge expects revenue to more than double. "It's not like we're General Motors," he laughs. "But people realize there's money to be made in this business now." Hunge isn't the only giddy sutler. Civil War nostalgia has grown into a micro-industry, with specialty stores across the country looking to sell everything from muskets and haversacks to tents and bone toothbrushes. Haberdashers are stocking extra 19th century costumes for Civil War era soldiers, civilians, and even children. Outfitting reenactors is an essential part of a multifaceted Civil War industry that kicks into high gear a few times per century. Bradley Hoch, chairman of the Gettysburg 150th Anniversary Steering Committee, thinks the number of visitors to the area could increase by 33 percent this year, to a record high of 4 million. During the entire sesquicentennial, says Hoch, "We might be looking at total tourist dollars of $2.7 billion or more." To lure these revelers, Hoch is planning "a rolling thunder of cannon fire." Beginning in April, when the first shots of the Civil War were fired at Fort Sumter, off the coast of Charleston, S.C., there will be demonstrations of events ranging from 19th century domestic life to the burning of Chambersburg, Pa., by Confederate troops. "We'll be using laser lights to simulate the burning," says Janet Pollard, director of Chambersburg's Visitors Bureau, "along with some smoke effects." Hoch and his team are already planning the reenactment of the Battle of Gettysburg, scheduled for July 2013. And the pressure is on: The last major Gettysburg reenactment—during the 135th anniversary in 1998—was considered the benchmark, with an estimated 30,000-plus players and 50,000 spectators. For Big Sutling, the sesquicentennial couldn't have come at a better time. During the '90s, "It wasn't unusual to have 20,000 reenactors on the field," says Rea Andrew Redd, a Civil War player and director of the Eberly Library at Waynesburg University in western Pennsylvania. "You sometimes had to pinch yourself." Over the past decade, though, the numbers have dropped significantly, Redd says. According to Tony Horwitz, author of Confederates in the Attic, a post-9/11 mentality is partly to blame. "It's harder to play-act war when we have two real ones," he says. Horwitz also points to a generational shift: "Younger people, addicted as they are to computers and other devices, aren't as keen on spending their weekends in the 19th century." For veteran reenactors, however, there is nowhere they'd rather be. Scott Harris, director of Virginia's New Market Battlefield State Historical Park, recalls one role player who paid for inexpertly done dental care "so his bridgework and fillings would look more like they did in 1860." According to Horwitz, many reenactors "will starve themselves to achieve the gaunt, hollow-eyed look of underfed Confederates." Others, he notes, might "soak their uniform buttons in urine to oxidize the metal and give it the patina it would have had in the 1860s. They'll sleep in ditches and avoid modern words when in the field. They'll do everything short of firing live ammunition." This enthusiasm is now spreading to parts of the U.S. not known for Civil War lust. Amateur historian Phil Williams is co-organizing an event called Freedom Fair in Colorado Springs, Colo. He hopes the festival, built around reenactments, will run for three weeks during each sesquicentennial summer, up to 2014. Williams doesn't mind that Colorado didn't join the Union until 1876, more than a decade after the war ended. "Colorado boasts 290 days of sunshine," he says. "We have a lot of green, lush area around us that can be used for reenactment battles. If we put up enough buildings that kinda look like Gettysburg, people will get the basic idea." Yet historical accuracy can be divisive. Michael Givens, commander-in-chief of the reenactment outfit The Sons of Confederate Veterans, says his organization's goal is to "make sure that the true history of the South is represented." In December the SCV was involved in a $100-per-person "Secession Ball" in Charleston that featured a reenactment of the signing of South Carolina's Ordinance of Secession—as NAACP protesters picketed outside. The SCV's staging of Confederate President Jefferson Davis's swearing-in ceremony—held on Feb. 19 in Montgomery, Ala.—was also controversial. Politics aside, many Union descendants are also heeding the call. Jeff Chandler, a real estate investor in Kissimmee, Fla., is the great-great-grandson of a member of the Fifth Regiment Maine Volunteer Infantry, which fought in Gettysburg. Last July Chandler visited a Gettysburg reenactment as a spectator and decided, "I want to feel their struggles, everything they went through." He's now ready to pay thousands of dollars for authentic-looking uniforms, accoutrements, and arms. "Whatever you put into this," he says proudly, "you're going to get back." CWL: Yes, I said that. Images' Source: Civil War Librarian---Top Image: Maryland Monument at Gettysburg, Second Image: CWL and CWLady at ball in Lynchburg Virginia, 2009. Sesquicentennial News----Abraham Lincoln [Frtiz Klein] Travels Again From Springfield to Washington D.C.
President-elect Abraham Lincoln Travels from Springfield, Illinois to Washington, D.C. The year-long Ohio Statehouse Sesquicentennial celebration continues with a visit from “Abraham Lincoln” to the Ohio Statehouse 150 years to the day after his February 13, 1861 visit. Abraham Lincoln traveled through more than 83 cities and towns in Illinois, Indiana, Ohio, Pennsylvania, New York, New Jersey and Maryland on his way to Washington from February 11-23, 1861. This 150th anniversary program highlights the concerns, fears and hopes Lincoln felt as the nation teetered towards secession and civil war. 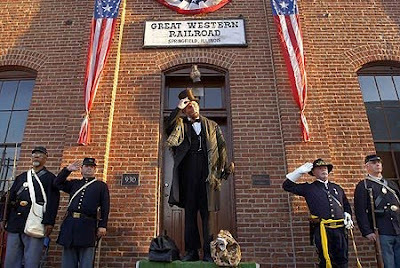 Abraham Lincoln re-enactor, Fritz Klein, will give a portion of the actual speech that Lincoln delivered to a standing-room only crowd on this exact day, in this exact place, 150 years ago. It was also on this very special day in 1861 that Lincoln received notice that the Electoral College vote had gone his way; he was, in fact, President-elect. During his time in Columbus, Lincoln stayed at Governor Dennison's family home. The program is presented with marketing support from the Ohio Historical Society, Ohio Division of Travel and Tourism and Experience Columbus. Following is the web link to the 90 minute program. CWL: CWL was present February 14 when Abraham Lincoln [Fritz Klein] marked the 150th anniversary of his visit to Pittsburgh, PA by appearing at Soldiers and Sailors National Museum's auditorium. One of the highlights of the 1861/2011 sesquicentennial celebration!!! CWL was photographed with Lincoln/Klein holding CWL's Wide Awake 1860 presidential campaign banner. Play the Ohio State House video with your eyes closed and the lights dimmed. The veil between between you and the Civil War era will grow thin. Klein uses Lincoln's words exclusively. The Willard: Where Hope Collapsed As Slavery Raged, Michael E. Ruane, Washington Post, February 9, 2011. 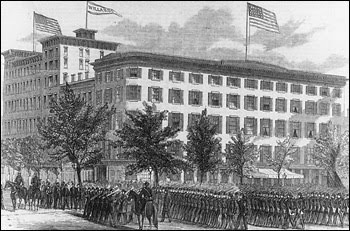 The delegates used separate hotel entrances: Pennsylvania Avenue for Northerners, F Street for Southerners. They shouted, argued and one day almost came to blows before their chairman, a former U.S. president, yelled, "Order!" Then, the day before Valentine's Day 1861, one of the aged attendees passed away in his hotel room, begging colleagues from his deathbed to save the Union so he could die content. They failed. 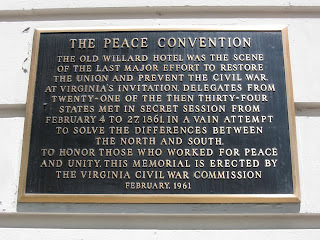 Indeed, there wasn't much peace at all during the "Peace Convention" at Washington's Willard Hotel that winter. And despite the dying wish of sickly old Ohio Judge John C. Wright, his beloved Union was soon torn in half. 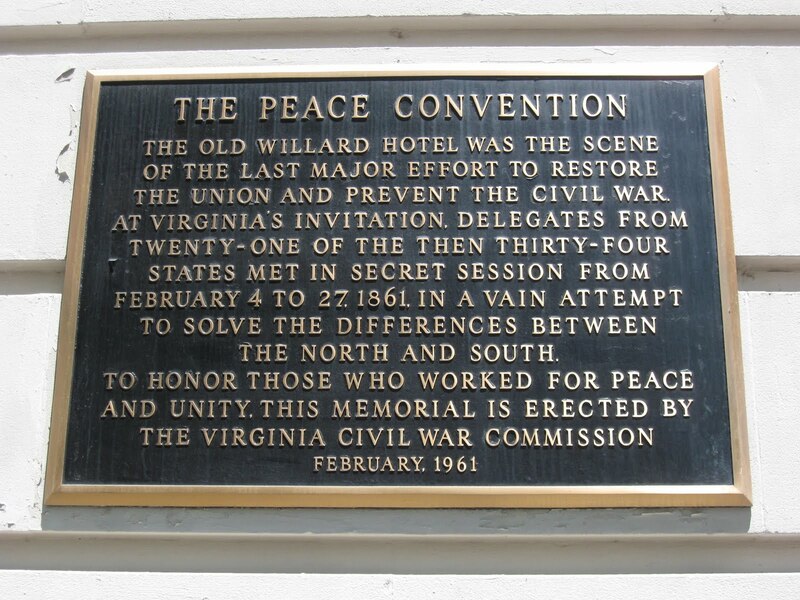 This week, as part of the Civil War Sesquicentennial, historians are gathering at the Willard InterContinental hotel to remember the failed, and largely forgotten, peace conference of 1861. There, 150 years ago this month, 132 delegates from 21 states bickered, bargained and tried in vain to bridge the chasm that widened beneath them even as they met. Six weeks after they adjourned, the war began. And the memory of the men and their meeting faded. But for three weeks that February - the last winter of peace for four years - there was hope among the smoky parlors of the Willard that, as the Washington Evening Star wrote, "the threatening cloud is . . . rapidly passing off the horizon of the country's future." On Friday, a symposium, sponsored by, among others, the Lincoln at the Crossroads Alliance and the Abraham Lincoln Bicentennial Foundation, is scheduled at the hotel, followed by the dedication of a new outdoor plaque marking the anniversary. An existing plaque dates from 1961. The Lincoln foundation is scheduled to hold its inaugural meeting at the hotel Thursday, when it will announce its mission, call for proposals and host a reading by actor Stephen Lang of Lincoln's famous "Farewell to Springfield" address. The 2:30 p.m. plaque dedication is open to the public. The main focus will be on the peace conference, whose originator, former president John Tyler, told delegates: "If you reach the height of this great occasion, your children's children will rise up and call you blessed." It was an effort that, in light of events, seemed futile. Seven states already had seceded from the Union when the convention opened Feb. 4. The small Union garrison at Fort Sumter had been under siege for weeks and was running out of food. President-elect Abraham Lincoln, wary of the convention, was coming to Washington for his inauguration a month later. But at the time, the gathering had prospects and clout. Its illustrious delegation, headed by Tyler, included an array of elder statesmen and business leaders. And it assembled in what historians say was then the largest hotel in the nation. On the same spot as the current hotel, the old Willard was blocks from the White House, the Treasury and Newspaper Row, and just down muddy Pennsylvania Avenue from the Capitol. It was also close to one of the city's red-light districts, where some of Washington's thousands of prostitutes operated, according to Washington historian Cindy Gueli. "You've got the Willard here," she said. "You've got the red-light district there. You've got Newspaper Row on your left. And you've got all the [government] headquarters on Lafayette Square." Despite the looming calamity, said Lincoln scholar Harold Holzer, who is slated to speak at the symposium, it's a mistake to view the convention only in light of the war. "That's looking backwards through the wrong end of the telescope," he said. "The people who met were only trying to reverse the secession of a few Lower South states" and issues related to secession. "You can't look at it and say, 'We've got to stop this because 600,000 young men are going to die,' " he said. "They didn't know what was going to happen. . . . In that way, they were deluded." The convention hoped to offer a compromise - mainly about slavery - that would soothe the rebellious states and satisfy the militant northern abolitionists, scholars say. It also aimed to keep states in the Upper South from seceding. And the delegates "thought they had time," Gueli said. The states that sent delegates chose prominent citizens experienced in public affairs. In addition to Wright, 77, and Tyler, 70, delegates included War of 1812 veteran Gen. John E. Wool, 77; Ohio's former U.S. senator Thomas Ewing, 71; and a former New York Supreme Court chief justice, Greene C. Bronson, 71. The group also included Felix K. Zollicoffer of Tennessee, a future Confederate general, and Pleasant A. Hackleman of Indiana, a future Union general, both of whom would be dead on the battlefield within 12 months. Tennessee delegate Josiah M. Anderson would be killed after giving a secession speech the following November. And New York's James S. Wadsworth, the patrician landowner and future Union general, would be killed at the Battle of the Wilderness in 1864. But all that was ahead. Three days after the delegates assembled in secret, shielded by police, the Evening Star hoped that under the "happy influence" of the conference, "six months will find every seceded state restored to its allegiance to the Union." For good luck, the mayor of Washington lent the meeting a portrait of George Washington, according to historian Robert Gray Gunderson's 1961 account of the conference. Alas, many delegates brought their sectional differences along with their baggage. "There was a lot of fighting," Holzer said. "They just fought over every procedural issue. Clearly, one side wanted expansion of slavery. One side wanted curtailment of slavery. It was very much like the whole body politic." Gunderson wrote: "Amendments were appended to amendments and substitutions substituted for substitutions." The Star reported of the Feb. 25 session, "Today nothing has been done . . . because speech making has monopolized the precious hours." At one point, veiled insults flew. A brawl almost erupted. Tyler shouted: "Shame upon the delegate who would dishonor this conference with violence." Wright, who had made the difficult journey from his home in Cincinnati despite chronic bronchitis and failing eyesight, died Feb. 13. The next day, the delegates put aside their differences as his coffin was brought into the meeting hall for a funeral service. A letter was read from Wright's son in which the old man pleaded for the preservation of the union so he "would die content." The delegates then accompanied his body to the railroad station for its journey home. The peace convention closed Feb. 27 to a volley fired by 100 cannons. But its proposed 13th amendment to the Constitution was little more than "awkwardly phrased abstractions," according to Gunderson. It essentially perpetuated slavery in the South, barred it in the North and, under certain circumstances, permitted its extension. It was widely and bitterly criticized. The House of Representatives refused to consider it. In the Senate, shortly before dawn March 4, it was voted down, 28 to 7. About the same time, Abraham Lincoln, who had arrived in town about a week earlier, was just waking up at the Willard. In a few hours, he would go to his inauguration and himself appeal for peace. U.S. Coast Survey Civil War Map Among First to Visualize Slavery, Influence Lincoln’s Strategy, National Oceanic and Atmospheric Administration. February 10, 2011. It isn’t often that a map visually displays a moral issue facing a divided nation and then affects a President’s response. Yet nearly 150 years ago, the U.S. Coast Survey — NOAA’s predecessor organization — produced such a map that, according to historians, President Abraham Lincoln used to coordinate military operations with his emancipation policies. In addition to initiating a trend of statistical cartography, the map’s thematic display of “moral statistics” was revolutionary in affecting political change. Northern audiences were able to see that the first states to secede were those with the most slaves. Using shading to represent the human population, the darkest areas of the maps show the highest density slave populations, and the order of secession corresponds closely to the shade densities of the map. Moreover, a table in the corner of the map shows the number of slaves in each state and the proportion of slaves to the total population. The 1860 Census was supervised by Joseph Camp Griffith Kennedy who had wanted to include slaves by name in the U.S. Census Report, but Congress refused. Alexander D. Bache was the U.S. Coast Survey superintendent at the time, and the map was created under Edwin Hergesheimer, a cartographer with U.S. Coast Survey’s drawing division. The NOAA connection to the map had been lost over the decades. John Cloud, Ph.D., a historian and NOAA employee who was recovering significant Coast Survey cartographic products in NOAA’s Climate Database Modernization Program, recently discovered the connection with Hergesheimer and the U.S. Coast Survey. The Office of Coast Survey’s “Charting a More Perfect Union” project is supported by the NOAA Preserve America Initiative — part of a federal initiative to preserve, protect and promote our nation's rich heritage. NOAA’s mission is to understand and predict changes in the Earth's environment, from the depths of the ocean to the surface of the sun, and to conserve and manage our coastal and marine resources. Visit us online at www.noaa.gov or on Facebook at www.facebook.com/usnoaagov. 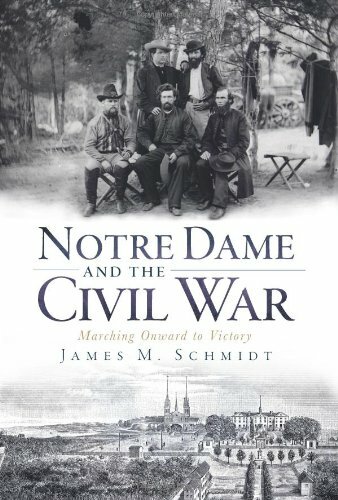 Notre Dame And The Civil War: Marching Onward To Victory, James M. Schmidt, The History Press, 144 pages, charts, illustrations, photographs,notes, $19.99. Great sacrifices were made during the Civil War. Colleges were burned, became battlefields, and lost students and faculty to the war. The University of Notre Dame was not yet twenty years old in 1861. Chartered in 1844 by the state of Indiana,and founded not by Irish Catholics but by French Catholics, Notre Dame was plagued by debts, disagreements and destructive flames during its first decade. The decade of the 1850s was a more stable time and the student body climbed from 70 to several hundred in 1860. The Underground Railroad passed through South Bend. Militia companies organized on campus. Over 90% of the student body called free states home; about 10% of the student body's homes were south of the Mason-Dixon Line and the Ohio River. Catholics were about 10% of all Federal soldiers and among the Federal armies' 500 chaplains there were about 30 Catholics. Most famous of these is Father Corby who blessed the Irish Brigade before its assault on the Stony Hill at Gettysburg during the late afternoon of July 2. The Sisters of the Holy Cross were housed in Saint Mary's Academy which were located on the campus. These Sisters as well as the Sisters of Charity and other orders provided constant care in the Federal hospitals encampments, hospital ships and hospital trains. At times they were the first responders on battlefields, such as Gettysburg. Throughout the war, Notre Dame held classes and graduations. Student life during these four year was quite raucous. Among the student body political debates generated fist fights. Voting in local, state and national elections incited spirited tussles. By the war's end the campus had housed William T. Sherman's wife and children. Returning students were now veterans and Notre Dame had its own Grand Army of the Republic post. Notre Dame is well served by Schmidt's clear, concise and well cited monograph. On each page is an anecdote that provides insight to the personalities and the climate of the opinions among the students and faculty. Schmidt's story of Notre Dame's is reflective of other Northern educational institutions that passed through the war. Other institutions would be lucky to find writers such as Schmidt to tell the story of their war years. A chemist by education and profession, Jim Schmidt is currently employed as a pharmaceutical research scientist near Houston, Texas. Jim has had a lifelong interest in history and has written more than fifty articles for North & South, World War II, Learning Through History and Chemical Heritage magazines. He is the author of Lincoln's Labels and Years of Suffering and Change. Jim Schmidt is an active member of the National Museum of Civil War Medicine and his column "Medical Department" has appeared regularly in the Civil War News since 2000. Paul D. Escott, Wake Forest University: "This original and outstanding book is significant not just for scholarship about North Carolina but also for our understanding of southern culture as a whole in the Civil War era. The research is impressively thorough, and the analysis is wisely and thoughtfully done." 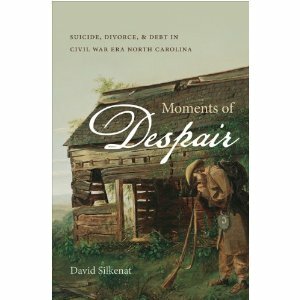 UNC Press: "During the Civil War era, black and white North Carolinians were forced to fundamentally reinterpret the morality of suicide, divorce, and debt as these experiences became pressing issues throughout the region and nation. In Moments of Despair, David Silkenat explores these shifting sentiments." "Antebellum white North Carolinians stigmatized suicide, divorce, and debt, but the Civil War undermined these entrenched attitudes, forcing a reinterpretation of these issues in a new social, cultural, and economic context in which they were increasingly untethered from social expectations." "Black North Carolinians, for their part, used emancipation to lay the groundwork for new bonds of community and their own interpretation of social frameworks. Silkenat argues that North Carolinians' attitudes differed from those of people outside the South in two respects. First, attitudes toward these cultural practices changed more abruptly and rapidly in the South than in the rest of America, and second, the practices were interpreted through a prism of race." "Drawing upon a robust and diverse body of sources, including insane asylum records, divorce petitions, bankruptcy filings, diaries, and personal correspondence, this innovative study describes a society turned upside down as a consequence of a devastating war." David Silkenat is assistant professor of history and education at North Dakota State University. CWL: This might be a portion of the real war that Walt Whitman said would never be written. "The Conspirator": Film and Historical Truth, Ron Briley, History News Network, February 7, 2011. Mr. Briley is Assistant Headmaster, Sandia Preparatory School. He is the author of The Politics of Baseball: Essays on the Pastime and Power at Home and Abroad. This is an abridgement of the review which is found in full at History News Network, February 7, 2011. Although academic journals such as The American Historical Review and The Journal of American History have expanded their focus to consider cinema, most historians still seem to approach historical films with considerable suspicion. Thus, the American Historical Association’s (AHA) Executive Director James R. Grossman demonstrated both excitement and trepidation when he introduced a screening of The Conspirator on the last evening of the AHA’s 2011 annual meeting. The 2011 film session, however, was somewhat different as, despite the disclaimer of Grossman, the AHA appeared to be endorsing a film project on which members of the historical organization served as consultants. The Conspirator is the first completed project of the American Film Company. CEO Joe Ricketts, founder of the online brokerage firm Ameritrade and a member of the family which owns the Chicago Cubs, explained to the assembled historians that his goal is to produce high quality and entertaining feature films which will attract adult audiences and be historically accurate. Ricketts asserted that with the rich variety of stories offered by American history there is no need for filmmakers to fabricate the nation’s past. The producer concluded that if The Conspirator is successful, the American Film Company is considering other projects such as a film on Paul Revere based upon the scholarship of David Hackett Fischer. The production values of The Conspirator are certainly first rate. The film is directed by Oscar-winning filmmaker Robert Redford, and the cast includes such respected performers as Robin Wright, James McAvoy, Kevin Kline, Evan Rachel Wood, Tom Wilkinson, and Danny Huston. Budgeted for approximately $20 million, The Conspirator will be distributed for theatrical release in the spring by Lionsgate and Roadside Attractions. The conclusion of the [AHA] panel was that the film deserved high marks for its historical detail regarding the case of Mary Surratt, who was executed for conspiracy in the assassination of President Abraham Lincoln. On the other hand, several members of the audience questioned whether it was really possible to make a motion picture about the Civil War without mentioning slavery. Thus, The Conspirator may be perceived as getting the details right, but missing what scholar Robert Rosenstone describes as the larger historical truths such as placing slavery at the center of our discussion on the Civil War. Although the film focuses upon the trial of Mary Surratt (Robin Wright) by a military tribunal, the story is told from the viewpoint of her attorney Frederick Aiken (James McAvoy), who was a Union war hero before resuming his law career. Aiken is reluctant to accept the Surratt case, but he is assigned the case by Reverdy Johnson, a former attorney general currently serving as a United States senator from Maryland. The historians on the AHA panel, however, assumed that Surratt was probably involved with the murder conspiracy, but they did acknowledge that the government employed the prosecution of Surratt to gain leverage against her son.
. . . Several members of the AHA audience suggested, it becomes easy to read the film as an allegorical commentary on the response of the Bush administration to the terrorist attacks of 9/11. Screenwriter Solomon, however, asserts that that the script for The Conspirator was written before 9/11. Nevertheless, it would certainly appear that doubts about the Patriot Act and concerns over violations of the civil liberties of those incarcerated in the global war on terror contributed to getting this script to the screen. Yet, Solomon insists that his script is really rather ahistorical. He uses the stories of Mary Surratt and Frederick Aiken to examine the love of a mother for her son, alongside a surrogate son prepared to assume the role abandoned by John Surratt. This confession may explain why several women at the AHA screening expressed disappointment that a film ostensibly focusing upon a female protagonist becomes, in fact, a motion picture about the relationship between a mother and a son. The film belongs to Frederick Aiken and not Mary Surratt. But this is not the most troubling issue regarding the film. As one AHA member observed, is it really possible to make a film about the Civil War era and not mention the word slavery? The Southern Surratt family had been slaveholders before falling into more difficult economic times, but this fact is not alluded to in the film. Thus, it is possible for viewers to provide alternative answers to this question which deny the centrality of the slavery issue to the origins of the Civil War. Those who attended a secessionist ball in Charleston, South Carolina may assert that they are commemorating a commitment to states’ rights rather than celebrating an effort to preserve the institution of slavery. And The Conspirator fails to offer any cinematic challenge to such an assumption. One may view The Conspirator free from the disturbing questions of race and slavery. Perhaps this will make the film appealing to a larger audience, but it will do little to foster popular understanding of the Civil War as we observe the 150th anniversary of that conflict. The Conspirator is an entertaining film which includes more accurate historical detail than most Hollywood productions, but it misses some of the larger historical truths and issues which must be examined to understand America in the 1860s and the legacy of slavery and the Civil War. CWL: The Internet Movie Database lists the release date as April 15. From Railroads of the Civil War: An Illustrated History, Michael Leavy, Westholme Publishing, 2010. 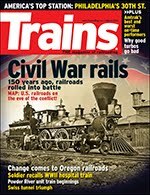 Page 14: "The first use of railroads to support a military conflict came in the 1840s during the war with Mexico where, because of their scarcity, they were used modestly to transport troops west. 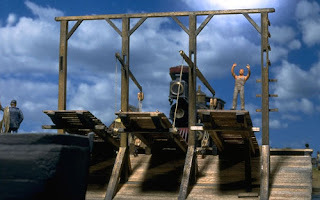 The first railroad built specifically for warfare was the line built at Balclava during the Crimean War in 1855." The image is found on page 4. The caption is "The first direct military use of the railroad occurred during the Crimean War. 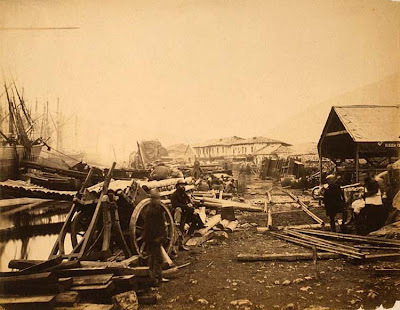 A track was laid across Crimea from the harbor at Balaklava to Sevastapool in order to expedite ammunition and supplies to British and French troops. Here the railway bed is being prepared. 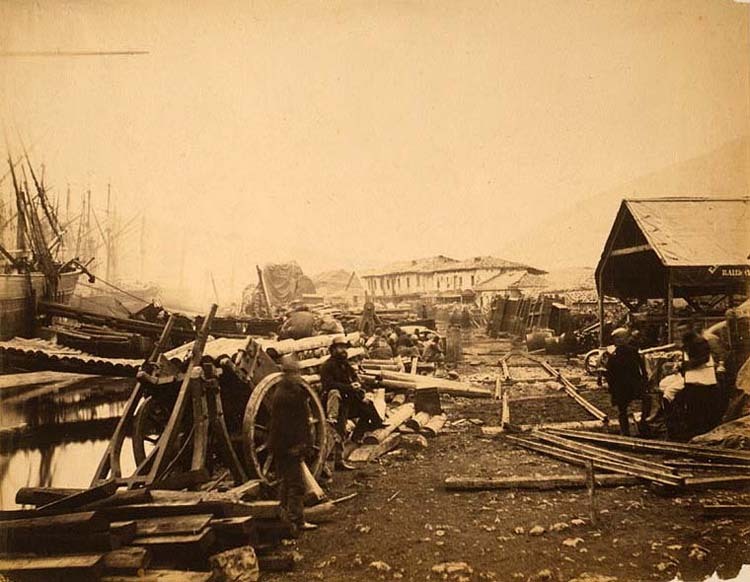 Iron rails and other supplies can be seen in the photo taken in 1855 by Roger Fenton. The image is in the Library of Congress. CWL has just started Railroads of the Civil War and it may be one of the more noteworthy additions to Civil War book shelves during the sesquicentennial. Civil War Rails: How Railroads Changed The American Civil War, John P. Hankey, Trains: The Magazine of Railroading, pp.24-35, 16 illus, map, charts, March 2011. Hankey labels the American Civil War as the first industrialized war and the first war in which railroads and telegraphs were central to the outcome of the war. With the Souths defensive strategy, the Confederacy based is survival on innovative tactics supported by active and timely logistics. To win against the Union, the Confederacy had to not lose in the short run and secure a peace before the long run began. Hankey states that the success was not contingent to the fact that the South had less than half of the railroad mileage which the Federals had. Neither was the fact that Southern railroads were not networked was required for a successful drive for independence. By contrast the Federals' sharp awareness of the central planning needed to harness the iron horse for the preservation of the Union is revealed in two decisions made in 1862. The authorization of a transcontinental railroad and creation of a framework for the Military Railroad department. 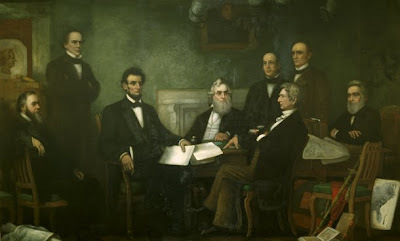 The secession of the deep South in early 1861 freed the Federal Congress on July 1 1862 to designate the route of the transcontinental railroad between Council Bluffs, Iowa and Sacramento, California. Congressional acts in the same year authorized federal invention and partial control of individual railroads and telegraph property. With the Union at stake, the mixing private enterprise with profits, and Federal needs army personal was the key to its preservation. It also helped that two the general manager of the Erie Railroad and the chief engineer of the Pennsylvania Railroad were commissioned as army generals. Daniel C. McCallum, the general manager, and Herman Haupt, the engineer, integrated the railroads, the telegraph and army logistics is such a fashion that the U.S. field officers did not have to meddle with railroad workers. These two men created a military organization that brought together railroad professionals, army professionals, railroad laborers and army non-commissioned soldiers and achieved what appeared at the time be to miracles. Hankey cites the first Confederate misstep was Jackson's April and May 1861 demolition and theft of the Baltimore and Ohio property. 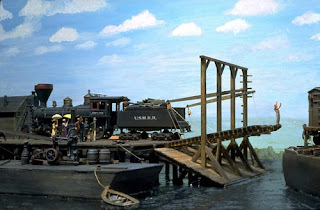 The company was a private enterprise and both Marylanders and Virginians employed in the Baltimore, Maryland to Wheeling, Virginia [no West Virginia until 1863] railroad lost their incomes. Jackson damaged the B&O to the tune of $35 million [2010 dollars] with additional damages to the local economies of secession friendly Maryland counties and loyal Virginian counties. Certainly it may have begun the slide out of the Confederacy of the counties of Virginia's northern panhandle. Confederate successes were forthcoming. Moving Johnson's troops to Manassas in July 1861, Bragg's 32,000 from Mississippi to Tennessee in the summer of 1862, Longstreet's corps from Richmond to Georgia in September 1863 are notable successes. Yet the Federals matched these efforts in and exceeded them in the delivery of supplies to the battlefronts. Hankey cites the movement of railroad cars packed in the north, shipped to Washington, D.C., moved across the Long Bridge and to the Alexandria docks, then onto Potomac River barges, sailed to Aquia Creek, Fredericksburg or City Point and unloaded within a few miles of the Federal army. Hankey discusses how the U.S. Military Railroad department grew with their mission and and how Confederate leaders failed to complete their mission. He covers the essential railroad numbers of the conflict such as the six railroads serving Richmond. Notable Southern zeros include the number or railroads that interchanged with each other in Richmond, the effective annual production of rail in the South after the war began, and the number of new locomotives completed in the South during the war. In another chart, Hankey lists Civil War railroad turning points. In a marvelous color map, Hankey shows the 317 railroads in the U.S in 1861, their routes, and their gauges. Though there are no citations in the essay and there are some generalization that may be contested, Hankey sets forth a fine overview of the terms and conditions of how railroads influenced the strategy and tactics, the limits and possibilities, and the outcome of the American Civil War. Diorama Image Source: Diorama modeled on Civil War era photographs. Diorama located in Alexandria Virginia Historical Society. Diorama model maker is Bernard Kaminski. 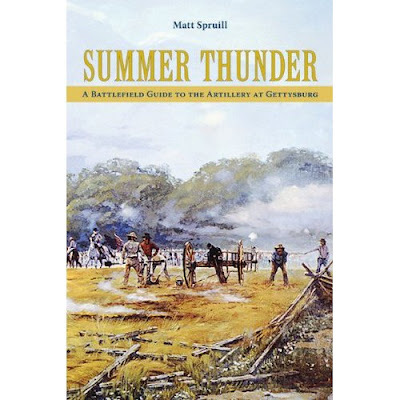 Review by Craig Swain of Summer Thunder authored by Matt Spruill, Posted on the weblog To the Sound of the Guns: Civil War Artillery, Battlefields and Historical Markers February 2, 2011. Summer Thunder: A Battlefield Guide to the Artillery at Gettysburg, Matt Spruill, University of Tennessee Press, 2010, 326 pages plus index, b/w photos and maps, paperback, $29.95. When I first heard of this book, my thought was “yet another book for an already full section on my shelf.” Readers are probably familiar with The Artillery of Gettysburg by Bradley Gottfried and Silent Sentinels by George Newton. Both works cover the topic from different approaches. Spruill’s new offering perhaps splits the middle of the two earlier works. Spruill starts with eighteen pages of introduction and prelude. I mention the introduction, as the author includes several technical and organization details, in addition to discussing sources and honoring supporters, which follow into the prelude. From the start, Spruill sets a tone – his work looks at the battle with an eye to how the weapons were employed and why they were employed in that manner. I particularly enjoyed the tables and discussion focused on the provisioning of Confederate batteries. Spruill provides hard data to support the well known premise that Confederates suffered because of mixed battery composition. In the next three chapters, Spruill provides a tour of Gettysburg with thirty-five stops (not counting sub-stops). Each chapter covers a full day of the battle. Each stop narrative begins a short description of the terrain, forces, and situation. Spruill includes first hand accounts of the action that occurred at the stop, mostly pulled from the Official Records. Then he provides his own interpretation, including details not offered in the chosen first hand account (particularly the movement of infantry formations). Directions between stops are clear and concise. Spruill spends about two pages in the last chapter discussing the retreat from Gettysburg, then provides his conclusions about the artillery employment in the battle. He provides four elements that gave the Federals an advantage over the Confederates in the battle – organization, application of the artillery reserve, leadership, and logistics and maintenance support. None of these are groundbreaking observations, and may be found in many general histories of the battle. Spruill devotes the pages to covering the points in detail. The rest of the book, about forty pages, contains appendices with the artillery order of battle, distribution of weapons, and technical details about the cannons used by both sides. The last appendix is a tour of Benner’s Hill, which, to my confusion, was not included in the main tour. In the technical section about the cannons, I noted some details that only a cannon-nut like myself would pick out. One photo provided for the Blakely Rifle is instead a James Type 3. Photos for the 24-pdr field howitzer are of the Austrian type on display at Gettysburg, not the regulation US production for which the data is provided. Both are minor issues. And I would note that even cannon enthusiasts considered the James Type 3 some sort of Blakely until more research demonstrated its American origin! Maps and illustrations provided complement the text without overdoing things. The maps are without a proper scale, but visitors should have no problem picking out landmarks in relation to unit positions. In addition to portraits and wartime illustrations, Spruill includes many modern views of the battlefield. While these are good for perspective, in some cases providing a visual cue telling the reader where to stand while on tour, I find black-and-white photos lack the detail for the fine details. This limits their usefulness to readers outside the battlefield. However, I feel photo decisions like that are more often made by the publisher, not the writer. Summer Thunder is not just a tour guide with artillery related stops! In comparison to the other works on this subject mentioned above, Spruill offers a closer examination of the topic, and in that way a more direct handling of how artillery was used on the battlefield. The size and weight of Summer Thunder makes it a good “carry along” book. I find the book a useful addition to my ever growing library. News---ISO Atlanta's Battlefields: "It's just a huge crime scene." 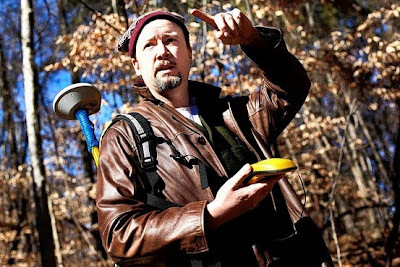 Archaeologist Mines Atlanta Landscape for Remains of the Clash Between Union and Confederate Armies, Cameron McWhirter, Wall Street Journal, January 31, 2011. When Gen. William Tecumseh Sherman arrived here in June 1864, he wrote to his superiors, "The whole country is one vast fort." Gen. Sherman and his 100,000 men encountered 65,000 Confederates dug in along 12 miles of earthworks at Kennesaw Mountain. After fierce fighting, the rebels retreated to nearby Atlanta. Several more battles ensued before Union forces took the city, dealing a crippling blow to the South. Today, metro Atlanta—a land of expressways, subdivisions and shopping malls—has grown to about 5.7 million people, from about 10,000 in the 1860s. So it's easy to assume that evidence of the famous clash of armies has been obliterated except for that preserved in museums, parks and monuments. That assumption is wrong, according to Garrett Silliman, a 36-year-old archaeologist for an environmental and land-use consulting firm. Mr. Silliman's employer, Edwards-Pitman Environmental Inc., has a contract with Cobb County and the Georgia Department of Transportation to identify battle sites to preserve—or at least excavate—before bulldozers plow them under. He is hoping that as the 150th anniversary of the Civil War arrives this year, governments will take a renewed interest in preservation. Battlefield archaeology is meticulous work. It takes years of education and mastery of sensitive equipment, including global positioning systems, ground-penetrating radar, advanced metal detectors and extremely precise mapping software. "It's just a huge crime scene," said William Lees, president of the Society for Historical Archaeology and a professor at the University of Western Florida. "You are just trying to figure out what happened there by what was left behind." If Mr. Silliman finds a clump of unspent bullets, he knows it was where men fumbled with ammunition shortly before an attack. If he finds shattered bits of bullets and belt buckles, he knows it is where soldiers encountered heavy fire. This forensic detail helps Mr. Silliman and other archaeologists develop a much clearer picture of parts of specific battles and also helps them understand overall military strategy at the time. "We can really create a good picture of what was happening even with a limited archaeological record," Mr. Silliman said. On a cold January morning, Mr. Silliman set out in his Land Rover in search of forgotten battlefields hidden amid heavily developed suburbs. His first stop was a municipal water tank atop a low hill in the shadow of Kennesaw Mountain. In 2005, Mr. Silliman was surveying at the bottom of the hill when he fell in a hole. Cutting away kudzu with a machete, he discovered what he thought was an advanced trench line. Looking at maps and accounts of the fighting, he determined the unnamed hill was likely an advanced position of Alabama Confederates, captured by Union Midwesterners on June 15, 1864. Five years after he fell in the hole, Mr. Silliman has come back—with funding, county permission and equipment—to see what is still here. Mr. Silliman, who with a trim rounded beard and knit cap looks like a cross between a hippie and a Civil War colonel, hoisted on his back a GPS device that looked like a futuristic trumpet and pointed skyward. He carried a notebook to sketch battle lines that he would later scan into his computer. There were trenches made of piled mud and stone, running along the hill. The water tank destroyed trenches higher up the hill. A nearby utility line and a subdivision destroyed more down the hill. But the side of the hill, which is tough to build on, had been spared. The fortifications still stand a few feet high, despite years of erosion. "It's amazing how well preserved these things are, given everything that's happened," Mr. Silliman said as he tramped through the forest. Mr. Silliman stopped every few feet to log data to the satellite and sketch the line. He will probably come back in the spring with a metal detector to try to find bullets. Unlike collectors, who dig up items to trade or sell, Mr. Silliman uses detectors to figure out the battle's progress. Many first-hand reports from the battles and later recollections were wrong. Officers confused by the fighting or eager to impress superiors wrote accounts of battles that often made themselves look better and the fighting fiercer than they actually were. It's like any crime scene. Witnesses can't be trusted, but physical evidence can. Mr. Silliman's guess is that professionals have surveyed less than 10% of all the battle lines around Atlanta. Like many archaeologists, he considers his work on these forgotten battlefields to be more of a calling than a job. He has ancestors who fought for the Union, and says he wants to preserve what he can for future generations. "It's our Iliad," he said of the conflict. 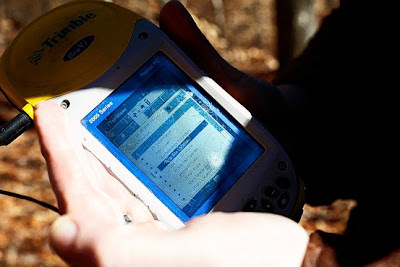 First Image Caption: Garrett Silliman points toward a rifle pit he found this month while using a GPS system in the woods of Smyrna, Ga. The detritus of war—bullets, uniforms, cannon shot, swords and, of course, corpses—was strewn across the region in the aftermath. Trenches, both intricate defenses built over weeks by engineers and shallow pits frantically dug by infantry under fire, snaked for miles. Second Image Caption: Garrett Silliman uploads the site's coordinates for comparison with old Civil War era maps. But the work's goal is simple: to reconstruct a battle. Text and Image Source: Wall Street Journal, January 31, 2011. CWL: There will be a time when CWL is the guy in the photograph. "Fascinating story. Hopefully he'll be able to find much more, despite the depletion of the battlefields." 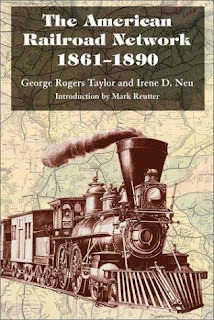 The American Railroad Network, 1861-1890, George Rogers Taylor and Irene D. Neu, Harvard University Press; 1956, Arno Press, 1981; University of Illinois Press, Paperback/Map edition 2003, 113 pp., notes, index, two maps, $19.95. It speaks well of The American Railroad Network that since its first publication in 1956 it has been republished twice and by two different publishers. Offering an historical antebellum background to the railroads that existed at the beginning of the war, the authors focus upon the dominance of local and regional economic markets. The clear and concise first chapter sets the groundwork for railroad improvements in general and the conversion of the fragmented and non-standard gauge of railroads in 1860. The value of this book for the Civil War reader is the charts and maps. 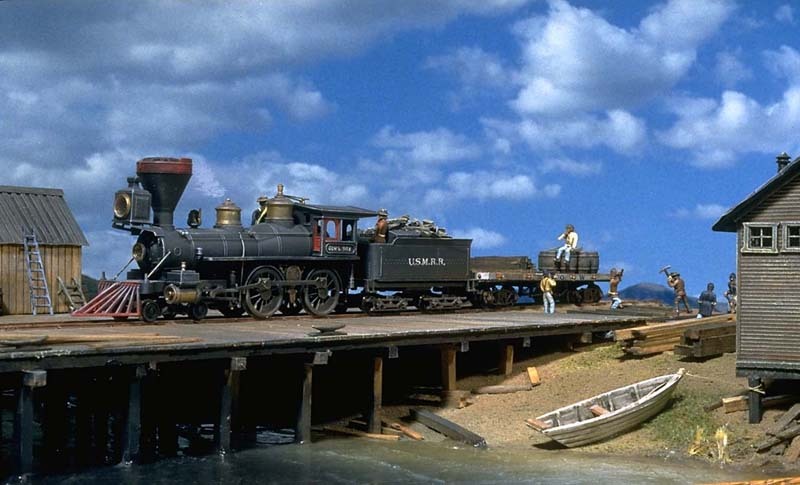 The United States contained seven different railroad gauges in January 1861. There were 350 railroad companies with 34,250 miles of track. A bit more than fifty percent of track was 4 feet 8 1/2 inches between rails and was owned by 210 of the 350 companies. The other 140 companies with a little less than fifty percent of the track and their gauges were between 4 feet 9 1/2 inches to 6 feet even. By 1861 no part of the U.S. was more adequately provided with railroads than southern New England and the northern mid-Atlantic states. The first railroads were built in Massachusetts and Rhode Island with the 4 feet 8 1/2 inch gauge. This gauge migrated to New York, Pennsylvania and New Jersey. 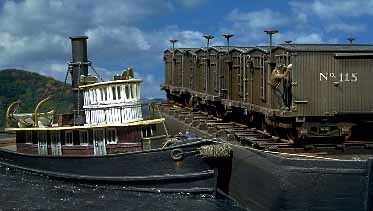 New York state contained three gauges, which hindered the quick transport of goods by rail. Pennsylvania's railroads, like New York's, were segmented by regions. Those in the eastern part of the state were and went north and northwest were for the anthracite coal trade and Philadelphia centric. Those tracks running west from Philadelphia sought access the Susquehanna River Valley's lumber trade and westward to Pittsburgh. Alternative gauges found in Pennsylvania were from Scranton northward toward the Hudson River Valley and from Pittsburgh westward to the Ohio River Valley. Gauge barriers existed at the western gateways of Buffalo and Erie along with Pittsburgh, Wheeling, and Parkersburg. Significant gauge barriers occurred in the Midwest, throughout the South and in particular, Southern cities. The authors examine Richmond and Petersburg Virginia in particular. In both of these cities local interested prevented the linking of railroad lines. This stance was endorsed by the Virginia legislature which enacted laws that allowed cities to forbid railroad companies from using the cities' streets. The citizens of Petersburg loathed any attempt to connect the railroads in Petersburg with the railroads in Richmond. In general the Civil War broke down regional and urban competition such as existed between Richmond and Petersburg. Military needs trumped civic economic needs. The federal Union's pursuit of the Transcontinental railroad's construction during the war on the 4 foot 8 1/2 gauge pressured new railroad construction to accept this gauge as the standard. The authors show how the federal Union solved the gauge differentials during the war by compromise, designing sliding wheels and car hoists. Authors offer two maps that reveal exactly railroad companies' gauges as they existed on April 1, 1861. One fold out map shows the companies and gauges from the mid-Atlantic east and southeast coast to the west shore of the Mississippi River. A second fold out map shows the companies and gauges from Maine to Washington D.C. 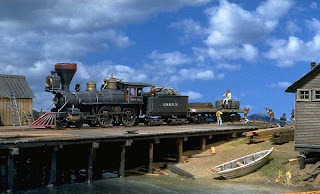 The American Railroad Network, 1861-1890 offers a succinct discussion of the dilemma of railroad gauges during the war and the solutions which the war forced the railroad companies to accept. The maps are large fold out maps that are clear and easily studied. It is an essential book for Civil War enthusiasts who are curious about the logistics of supplying 100,000 man armies. 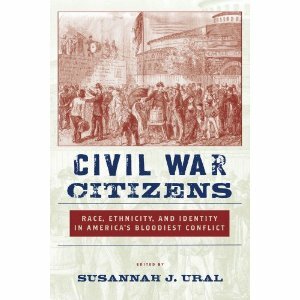 Civil War Citizens: Race, Ethnicity, and Identity in America's Bloodiest Conflict, Susannah Ural, Editor, Contributors: Stephen D. Engle, William McKee Evans, David T. Gleeson, Andrea Mehrländer, Joseph P. Reidy, Robert N. Rosen, and Susannah J. Ural, New York University Press, 256 pages, paperback, $23.00. NYU Press: "At its core, the Civil War was a conflict over the meaning of citizenship. Most famously, it became a struggle over whether or not to grant rights to a group that stood outside the pale of civil-society: African Americans. But other groups--namely Jews, Germans, the Irish, and Native Americans--also became part of this struggle to exercise rights stripped from them by legislation, court rulings, and the prejudices that defined the age." "Grounded in extensive research by experts in their respective fields, Civil War Citizens is the first volume to collectively analyze the wartime experiences of those who lived outside the dominant white, Anglo-Saxon Protestant citizenry of nineteenth-century America. The essays examine the momentous decisions made by these communities in the face of war, their desire for full citizenship, the complex loyalties that shaped their actions, and the inspiring and heartbreaking results of their choices-- choices that still echo through the United States today." CWL: Looks similar in topic to Margaret Creighton's wonderful Colors of Courage that presented new material on the civilians who experienced the Gettysburg Campaign. Finally Civil War Civilians is at an affordable price for libraries and enthusiasts and goes on the early summer reading list. 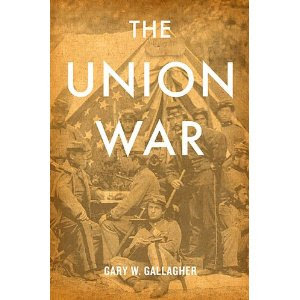 The Union War, Gary Gallagher, Harvard University Press, 256 pages, $27.95, April 4, 2011. Harvard University Press: Even one hundred and fifty years later, we are haunted by the Civil War—by its division, its bloodshed, and perhaps, above all, by its origins. Today, many believe that the war was fought over slavery. This answer satisfies our contemporary sense of justice, but as Gary Gallagher shows in this brilliant revisionist history, it is an anachronistic judgment. In a searing analysis of the Civil War North as revealed in contemporary letters, diaries, and documents, Gallagher demonstrates that what motivated the North to go to war and persist in an increasingly bloody effort was primarily preservation of the Union. Devotion to the Union bonded nineteenth-century Americans in the North and West against a slaveholding aristocracy in the South and a Europe that seemed destined for oligarchy. Northerners believed they were fighting to save the republic, and with it the world’s best hope for democracy. Once we understand the centrality of union, we can in turn appreciate the force that made northern victory possible: the citizen-soldier. Gallagher reveals how the massive volunteer army of the North fought to confirm American exceptionalism by salvaging the Union. Contemporary concerns have distorted the reality of nineteenth-century Americans, who embraced emancipation primarily to punish secessionists and remove slavery as a future threat to union—goals that emerged in the process of war. 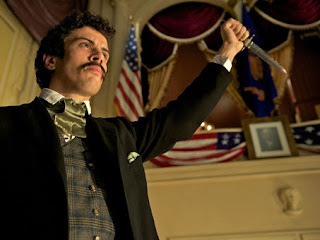 As Gallagher recovers why and how the Civil War was fought, we gain a more honest understanding of why and how it was won. CWL: Gallagher's outstanding work on the Confederacy and its armies motivation is well respected. CWL looks forward to Gallagher's close study of Federal soldiers' diaries and letters. America Aflame: How The Civil War Created A Nation, David Goldfield, Bloomsbury Press, 640 pages, color and b/w illustrations, notes, index, $35.00, March 15, 2011. Publishers Weekly: "This sweeping, provocative history of America from the 1830s through Reconstruction has two grand themes. One is the importance of evangelical Protestantism, particularly in the North and within the Republican Party, in changing slavery from a political problem to an intractable moral issue that could only be settled by bloodshed. The second is the Civil War's transformation of America into a modern industrial nation with a powerful government and a commercial, scientific outlook, even as the postwar South stagnated in racism and backward-looking religiosity. UNC-Charlotte historian Goldfield (Still Fighting the Civil War) courts controversy by shifting more responsibility for the conflict to an activist North and away from intransigent slaveholders, whom he likens to Indians, Mexicans, and other targets viewed by white evangelical Northerners as "polluting" the spreading western frontier. Still, he presents a superb, stylishly written historical synthesis that insightfully foregrounds ideology, faith, and public mood The book is, the author writes, "neither pro-southern nor pro-northern," but rather "antiwar." Goldfield's narrative of the war proper is especially good, evoking the horror of the fighting and its impact on soldiers and civilians. The result is an ambitious, engrossing interpretation with new things to say about a much-studied conflagration." 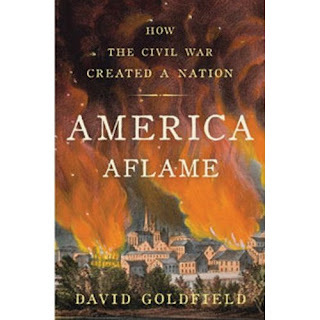 Gilbert Taylor, Booklist: A specialist in southern history, Goldfield assesses Civil War causes and consequences chronologically from 1834 to the termination of Reconstruction. Why begin in 1834? That year a Boston mob destroyed a Catholic convent; for Goldfield, that event is symbolic of a toxic factor in the period’s politics, evangelical Protestantism. Arguing that it promoted eschatological mentalities on both sides of the Mason-Dixon line, Goldfield, as his narrative navigates the 1850s, personifies evangelicals’ influence in Uncle Tom’s Cabin author Harriet Beecher Stowe and in southern preachers who sermonized on God’s sanction for southern rights, slavery included. The overtly religious aren’t the sole culprits in Goldfield’s interpretation. He critiques the increasing inflexibility of such politicians as former Whigs Abraham Lincoln and Alexander Stephens. Frederick Douglass and Walt Whitman stroll through Goldfield’s pages as eyewitnesses while he considers that the South’s fear for slavery’s future and for its exclusion from industrialization and westward expansion underlay variously argued causes of the war. But it is his emphasis on the religious angle that readers may find distinctive among Civil War overviews." CWL is looking forward grabbing a copy ASAP; too bad the book is released a week after spring break but will have to be added to the May [post-finals week] reading list.